How strong is your superego? According to Sigmund Freud, the balancing of the id, ego and superego is the key to a healthy personality. 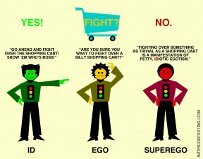 What then is the id, ego and superego? The ID is the unconscious component of the three. It is ruled by the PLEASURE PRINCIPLE, which seeks to gratify immediately all wants, needs or urges. If the id has it way, it will cause disruptive behaviours. For instance, a lady sees someone holding a pizza, and since her appetite has been stirred up, and her id wants to have that pizza immediately, she then snatches the pizza from the person to gratify her appetite. Or a man grabs a woman he doesn’t know on the road, and gives her a kiss, because his id is in control. ← Where is Your Nineveh?